Challenge #3: Do something that is typically seen as inappropriate for someone of your age. Oh the possibilities! Yesterday’s letter to the Easter Bunny totally qualifies as something many would find inappropriate for an almost-32-year-old. Today I played with kids a lot, but that’s because it’s part of one of my classes at the U. I felt like it was cheating to count that. So when I got home I decided to do some coloring. I have coloring books and crayons because I have nieces and nephews. I pulled them out to relive – not just my childhood – but my teenage years as well. My best friend, Dawn, and I used to color all the time in Jr. High and High School. We were pretty hip, I tell you. 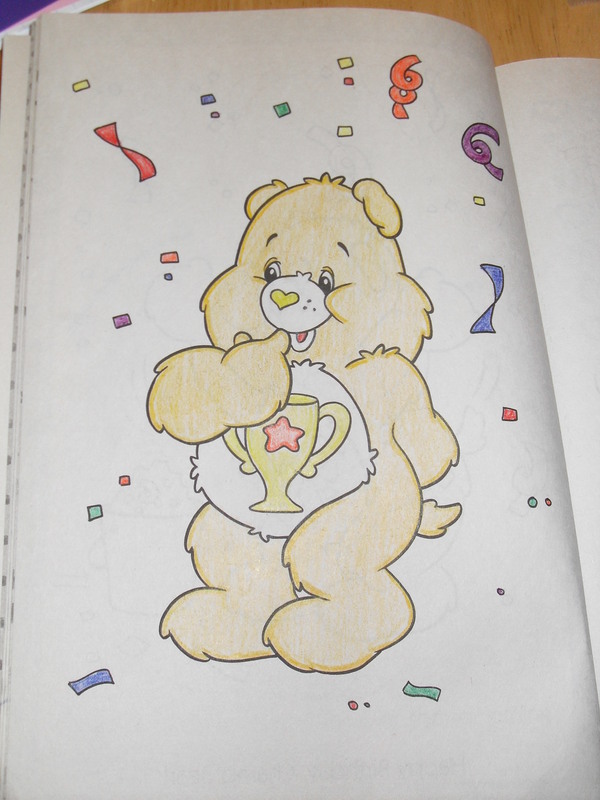 Anyway, the first coloring book I delved into was “The Care Bears.” Still totally jazzed from having completed the half marathon on Saturday, I decided to color Champ Bear. If I remembered correctly, Champ Bear was a color that was in the yellow family, and Holly was pretty certain he was gold. So I Googled him to be sure. What I found shocked me! Many of the images of Champ Bear depicted him as BLUE! What the? I scrolled until I found an image from the original movie, which confirmed that Champ Bear is indeed gold-ish. I’m a little offended that when they brought the Care Bears back from the ’80s that they changed his color. Seriously, what is UP with that? So not cool. Anyway, I colored him true to himself, and felt as though I was sticking to the man in the process. Bwahahahaha! The next picture I colored was one of Captain Hook. 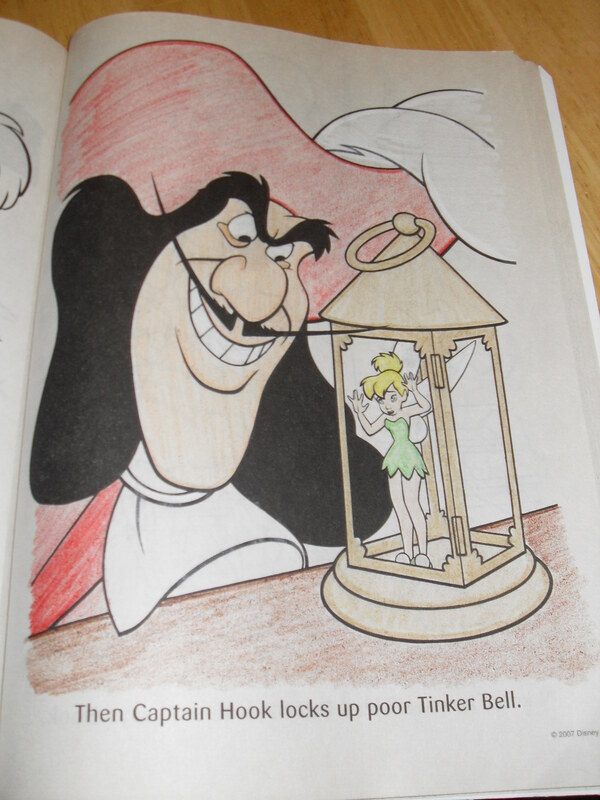 Really my favorite Disney villain is Maleficent, but I liked this picture of Captain Hook capturing Tinkerbell. Not that I wish any fictional character ill will, but what did she expect? Besides, she wasn’t exactly the nicest pixie in town. But, as with all fairy tales, everything worked out all right in the end. 1) when I was 19 and babysitting a little 5 year old boy, we were watching that movie and I was singing along. He looked up at me and asked “Are you Pocahontas?” I said no. He looked back at the tv, then back at me and said “But you sound like Pocahontas.” I assured him I wasn’t Pocahontas. He looked back at the tv, then back at me again and said “You MUST be Pocahontas.” What an awesome ego boost! Coloring is super fun. It’s like color therapy. Yes, I also have coloring books. I even have one at work. There’s just something so simple and happy about crayons and coloring books.